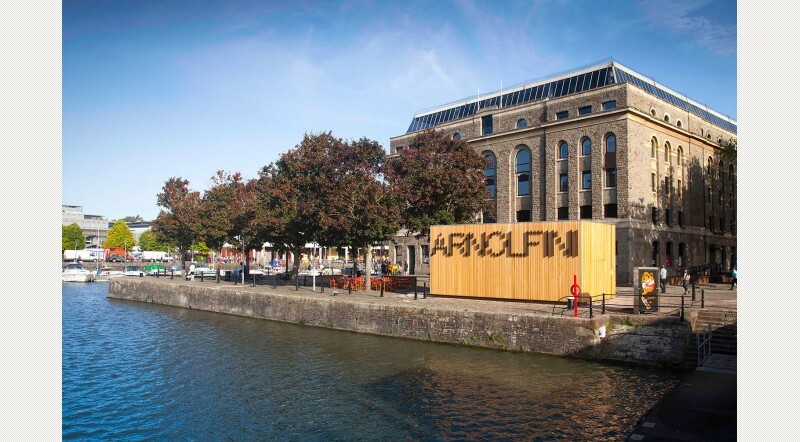 After 40 years at its current site, 2015 was Arnolfini’s year of rediscovery, with an extensive transformation project and an exciting contemporary arts programme, including outstanding solo shows by Richard Long and John Akomfrah. Arnolfini also worked on and offsite to engage, educate and inspire a record number of people via its inclusive learning initiatives, and began to develop an audience-led approach to programming, inviting the public to take part in developing new work. Design for a new Bristol icon, a layered stack of exclusive amenities comprising a public park, a spa, an art gallery and high end housing on the quays. It’s late summer and I have decided to spend the best part of the day around the new Arnolfini building in Bristol’s Floating Harbour. Since I was here last time in 2009 to promote the re-designed building and its exciting new ‘collection’ appropriately branded ‘THE GOOD LIFE, I have heard and read a lot about it, but this is my first real sight of what it has become and I have to admit, it surpasses all my expectations. I can see that Bristol’s old harbour is transforming itself rapidly into a lively centre for culture and commerce, including up-market residential property, business and retail spaces, trendy bars and restaurants. And all of it, if I may add, thanks to Arnolfini’s bold gesture into the future, taking as a lead THE GOOD LIFE, an artist proposal developed by Katleen Vermeir and Ronny Heiremans. You may remember their GOOD LIFE presentation in Arnolfini in spring 2009. It was quite unusual, the way it was set up in collaboration with an office for architecture (51N4E), a graphic designer (Pierre Huyghebaert), a filmmaker (Amir Borenstein), a sound artist (Justin Bennett), a lawyer (Eric Jooris), a costume designer (Mieja Hollevoet) and myself Carly Wijs, acting as the development’s real estate agent. Oh, and we shouldn’t forget the Arnolfini staff. At the time they did a magnificent job in making THE GOOD LIFE become real. Walking along the asphalt sunken old train tracks, the first thing I see from afar is the elegantly designed tower rising above the old building’s gutted shell. Tripling its former height it offers an impressive sight, truly a beacon of light, with the sun reflecting off the huge glass panels at the top of the building. As I approach I can see the light glinting off the metal sheeting of the slender shaft, supporting the monolithic upper structure, seemingly floating in mid-air. Sitting on the perfect spot in Bristol’s marina, with its reflection in the water, the visionary ‘lighthouse’ design blends in perfectly with the area’s history. The architects of 51N4E, an emerging office based in Brussels, fused industrial architecture of the past with hi-tech elegance of the 21st century. And it seems to me they have thought just about everything. Approaching the building’s bulky presence, I come across a terrace, pleasantly situated under the trees of Narrow Quay. I decide to prolong my curiosity before venturing in, and I order a large latte from the Pero open-air coffee bar. Handling the steel Rancilio espresso machine a youngster points me to a sunny part of the terrace. I seat myself in one of the well-designed chairs. All chairs and tables were commissioned from local international artists, and I notice they’re all up for sale. I kind of fancy the one I am sitting in, a brittle plastic eggplant-coloured cup chair. Looks vintage to me. I enjoy the sun and the waterfront while contemplating the success of THE GOOD LIFE development. It triggered numerous positive changes, economically, while alleviating the rapacious credit crunch of 2008. The only crunching going on here these days is at the stand-only lunch counter, where people are tucking into specials featuring crab and prawn cocktail with avocado, tomato salsa, and ciabatta croutons, and slow-roast spiced organic pork belly with soy, sesame seed and honey dressing. Apparently I am not the only person here admiring the new iconic building. From the accents I pick up around me, I gather people are traveling in from far afield. And I hear a lot of foreign languages too. All eyes are directed toward the hovering presence of the edifice. Seeing, is believing the scale of it. Forward thinking cities are embracing towers, which can positively enhance the cityscape and provide iconic landmarks that can contribute to put a city on the international map. I distinctly remember the excitement I felt during the project’s initial stage. And people’s reactions to it. Tom Trevor: “When we first moved to our current venue there was nothing here at all. Now the harbourside is packed. This part of the city has become a real hub. While other cities have been going for bombastic attempts to attract visitors with major museums, Bristol is making the most of its cultural heritage. Bristol is a city that is creative. We are an ideas city. Businesses are coming around to the idea that culture is important and we have to build on that. It is true that at their best, exciting buildings seem to appear in films and TV shows. They function as free ambassadors for tourists and locals alike. So it is a good thing to be brave. Bold buildings, meeting the world-class standards of the global business elite, complete the mix, which brings this city and its people the best urban living can offer. Now I want to have a look at what else there is. I enter the building’s emptied shell. I am deafened by the peace of the interior garden. Taking its inspiration from the English landscaped garden, it is an ingenious piece of art, yet designed not to look like art. From the plans and models I saw, and even from the artist impressions THE GOOD LIFE prospectus (2009) offered, it was hard to imagine this exquisite and imposing enclosure. For me as I see it now, it finally seems to live up to the idea of a renaissance patio, which was the inspiration for this original 19th century warehouse. Mr. Arnolfini, an Italian living in 15th century Flanders, after whose portrait, painted by the Flemish artist Jan Van Eyck, the organization was named, would have been delighted. And as I come to remember now, Mr. Arnolfini was a colleague of sorts, being a real estate agent himself, and a merchant. I always had The Arnolfini Portrait in mind at the time I dealt with THE GOOD LIFE project, which for me was more an act of curatorial passion than of profit chasing. And it proved that despite the funding crisis, there was still substantial demand for high quality buildings in prime locations with good quality tenants. But the thing that is truly amazing inside this secluded garden is when you look up and start to discern Bristol’s marina reflected in the convex lower part of the new building. Yes, I can imagine creative people being enchanted with this space opening up marvelous views. Anyway, we wouldn’t have sold to people who didn’t buy into the principle. I am really delighted that this garden is a privately owned public space in which people can sit quietly. The imposing enclosure, actually the building’s former façade, reminds me of a romantic image of a cathedral in ruins with trees growing about inside and outside. This is a peaceful place, a secret refuge to cherish. And it is kept pristine by hourly sweeping patrols and by its proper policing team. No beggars here. It is a very special environment and deserves that little bit of respect. Now seems to be the right moment for me to take the lift in order to have a look at the spaces hovering over the harbour. When I press the button I feel my body faintly holding back. I think of the lift getting stuck during THE GOOD LIFE film shoot. A disembodied voice saying: “Don’t panic, help is on its way” and then the gunshots. I step inside. The reward is immediate as I see the garden of delight sinking away below my feet while a breathtaking view is tilting itself in my field of vision. A disembodied voice says: “Enter THE GOOD LIFE – THERMAE”. I turn away from the view and penetrate the slightly saturated air and moist perfumes of the local spa. Two dark-haired oriental girls step from behind a counter and meet me. I immediately wish I could go in. I want to touch and feel these walls. The sensuous material and the supreme attention to every detail even in this lobby add a unique richness and interest to the building. I have never seen anything like this anywhere in the whole world. I am getting pretty envious of the residents in those 12 lofts perched above. How much more central to where it all happens can you get? Oh my God, how this has become a glamorous destination! From the position I am standing in I can see the huge glass façade panels, creating soaring floor to ceiling visual spans in each of the building’s unique homes. I can imagine a handful of lucky residents enjoying unrivaled intimacy, as well as psychedelic sunrise and sunset panoramas. These are lofts that offer potential for drama in daily life. I remember desire building up when I was showing people round the empty gallery spaces of the former Arnolfini. I still hear myself introducing THE GOOD LIFE – Collection, which would include a library, indoor and outdoor terrace, sundeck with infinity pool, a yoga studio, fitness center, steam room, catering kitchen and conference center. It is an incredible feeling to stand up here and experience how computer generated images floating in a void have been made totally real. Not even such a long time ago, all of this was merely a fiction. After today’s sunny afternoon in the heart of Bristol’s renaissance marina, it is clear to me that there is no need anymore to point to other places, which can give a valuable reason why one would want to live in this city, because this is it.